Apple's CarPlay feature, introduced earlier this week, may be able to be installed in older vehicles, according to new information from Mercedes-Benz. The car company has told 9to5Mac that it is working on "an after-market solution for previous cars," that would allow CarPlay to function in older models. We've confirmed that at least Mercedes-Benz is looking into aftermarket installations of CarPlay that will allow older models of vehicles to access the feature. While the company confirmed that it is trying to get an "an after-market solution for previous cars" it couldn't confirm when the option might become available. While there is no info yet on how the aftermarket installation would work, we'd imagine it will be a dealer installed accessory for select older models like Honda and others already offer for Apple's Siri Eyes Free feature. While it is unclear how an aftermarket solution might be implemented, information uncovered earlier this week indicates that CarPlay works in conjunction with BlackBerry's QNX car operating system. The QNX Car Platform is what powers many of the existing in-car infotainment systems installed in a wide variety of automobiles. CarPlay can be likened to Apple's AirPlay, utilizing in-car infotainment systems to mirror the iPhone's display and functionality, which indicates that it is a technology that can possibly be installed in older vehicles as well as new ones. It will be up to both individual manufacturers and Apple to decide whether aftermarket options will be available for older cars, however. Mercedes-Benz is thus far the only manufacturer that has indicated an aftermarket solution might be possible. The majority of CarPlay's functionality is supplied by the iPhone, including Siri voice control, Maps and GPS and access to features like messages, phone calls, and third-party apps. 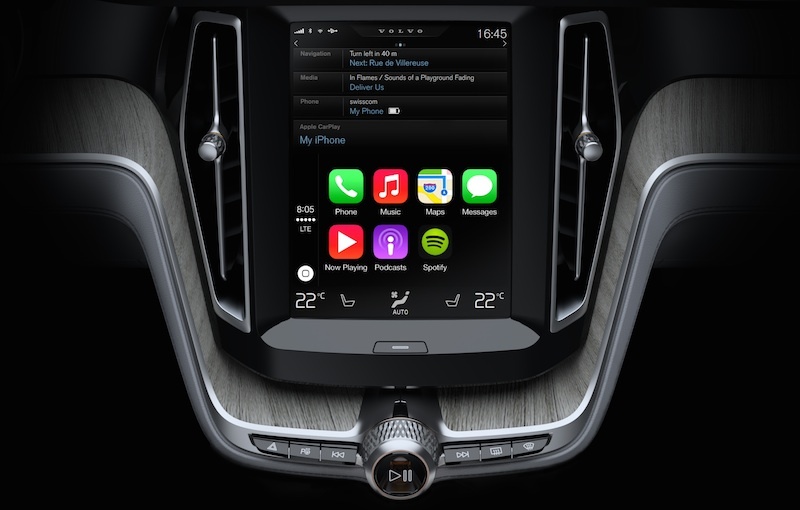 While CarPlay does currently require a hardware interface and a wired connection in the form of a Lightning connector, Volvo has indicated that Wi-Fi connectivity is coming in the future. At the current point in time, CarPlay has only been demoed in cars from Volvo, Ferrari, and Mercedes-Benz, but Apple has struck deals with several other manufacturers including Honda, Ford, GM, Jaguar, and Hyundai, all of which are expected to launch vehicles with CarPlay support in 2014. Update 1:32 PM: Mercedes-Benz has clarified that its "goal is to offer an after market solution by the end of the year." To really support older vehicles, or frankly even most new vehicles, we just need a double DIN solution from the usual folk (Kenwood, Sony, Pioneer, Jensen, JVC, Alpine, etc.). I don't know... This CarPlay stuff is rubbing me the wrong way. It reminds me a lot to Apple's 2005 collaboration with Motorola to make the Rokr "iTunes Phone". Two years later, Apple did it right with the iPhone. I'm not buying that CarPlay is "doing it right". I'm still trying to discover why this is important. And "doing it right" would be??? I can't see Apple getting in the business of developing imbedded OSes for automobiles that would have to work with competing devices. Not could I see car companies giving that control to Apple. It's been done in a 1981 DeLorean! There aren't any similarities between CarPlay and the Rokr. Apple is in complete control of the software here. This looks just like AirPlay, which has been quite successful. I hope the other manufacturers will offer a solution for older vehicles as well. My car doesn't even have a radio. Don't worry much. With iOS 7's CarPlay, many people will get a chance to enjoy Lada-quality UI on their vehicles. Dear Apple: Make two car stereos -- one single DIN, one double DIN. All you gotta do is make a nicely powered stereo with Bluetooth and USB ports with an Apple-quality touchscreen that basically replicates your apps with a modified iOS. If anybody thinks I'm crazy, go shopping for these things. The only thing close I have seen is AppRadio from Pioneer, and I use "close" generously. I'd love to replace my Camry's factory unit with a double DIN full touchscreen that would display my music or podcast art with larger buttons for controls and blow up my GPS display to about seven inches. Do I need an optical drive? Hells no. Do I even really need AM/FM? I mean sure if it doesn't cause much trouble. I'd rather have the Apple TV for cars. Yeah, Apple only needs to team up with Sony or Pioneer to create ApplePlay head units that would fit virtually any vehicle.